In the never ending world of strength equipment, it can be incredibly tough to find the perfect pieces of equipment, especially when building out a home or garage gym. One of the biggest decisions when building a home gym is deciding what type of power or squat rack will be best for an athlete because this often ends up being the most dynamic and focal piece of the gym. Today, we’ll be looking at the Force USA MyRack Modular Power Rack, which Force USA sent to us for review and office use. This power rack comes with a 12 gauge steel base and has the ability to be customized to suit multiple types of athletic needs. Within the review below, you can expect to find all of the construction characteristics of this power rack, the set up process, price, and warranty. If you’re pressed on time and need a quick rundown of what to expect from the Force USA MyRack Modular Power Rack, then check out our top takeaways below. For everyone else, read on to learn everything that comes along with this rack. Firm 12-gauge steel base with Westside hole spacing on the uprights. Decently space efficient for tight spots in a garage or home gym. Multiple add-ons make this a great option for versatile workouts. The base comes at a cost efficient price of $399.99. The Force USA MyRack Modular Power Rack has a couple key construction aspects worth noting. First, the base and uprights are made of an extra-sturdy steel construction that has a laser cut design, which means the edges, holes, and structure all have clean cut edges. Steel is standard across the industry for racks and Force USA offers a structural warranty on the steel used in this rack. Second, the uprights are made with 12 gauge steel. This is way to measure the thickness of steel, and a 12 gauge thickness tends to be pretty normal in power and squat racks. The uprights themselves are 2.4″ x 2.4″. The third to note about this rack is that there is Westside spacing running up the rack uprights. For those new to power racks, this means the holes are closer together so finding the right rack height is slightly easier. In total on the front and back there are 54 adjustment points. In respects to dimensions, the MyRack Modular Power Rack comes in with a width of a 47″ a height of 87″, a depth 55″, and the interior depth for the rack is 29″. The base of the rack comes with the option to bolt the rack to the ground or let it free stand. That’s a big perk for anyone who wants to keep their floors clean, and not every power rack comes with this option. Outside of the power rack itself, there are a couple cool customization features that come along with this rack. 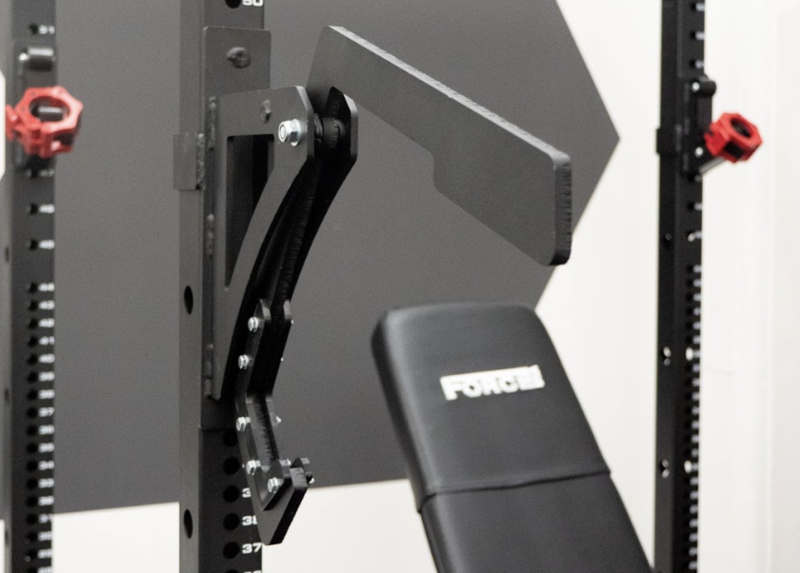 Force offers the ability to add on pull-up bars, j-hooks, and safeties. Force USA offers four different types of pull-up bars that range between $99.99-$169.99. For j-hooks there are two different options ranging between $49.99-$79.99, and there’s also a monolift option that costs $199.99. Then for safeties, there are three options that range between $99.99-$104.99. 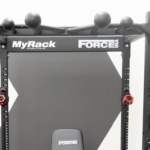 In respects to versatility, we think the Force USA MyRack Modular Power Rack does an adequate job at satisfying the needs of both the recreational and the series athlete. The power rack base is structurally well-built with a high quality steel and Force USA writes on their site that the base rack weight ratings comes out to about 2,000 lbs, which is more than enough for all types of athletes. In our opinion, the adjustments and finite construction features are what make this rack so versatile. With the ability to add various pull-up bars, safeties, and j-hooks/monolift, an athlete can build this rack completely catered to their sport and needs. This is big for athletes who like to compete in one sport such as powerlifting and need a specific type of setup for training to competition carryover. The power rack itself is a simple rack, so it’s not the most versatile in its bare bones nature, but it does offer Westside hole spacing. This type of spacing makes the rack slightly more accessible for various heights, and that bumps up the bare bones versatility of the rack for this review. Also, there are barbell holding holes in the back, which make this is good rack for holding various barbells that might be used for different sports. The Force USA MyRack Modular Power Rack is pretty easy to set up. The rack ships in three boxes and has a total weight of 176 lbs, so it’s pretty easy to carry in and transport into a garage gym by one’s self, although, it might take a few trips. In terms of total set up time, instructions, and tools. This power rack was one of the easier racks we’ve had to install. The total time of set up took about 50-minutes when the work was split up by two people. Note, we’ve built racks before, but we’re not rack building experts, so the time should be pretty true across the board for what you can expect. The instructions were easy to understand and there wasn’t any confusion about what piece went where. Some racks we’ve built has taken a decent amount of time understand which bolts and screws were what, but Force USA makes this process a breeze with their instructions. In respects to tools needed, this rack required two wrenches which tends to be standard with power racks that use heavier steel. The price of the Force USA MyRack Modular Power Rack starts at $499.99 for the base. If you were to compare this rack with other power racks with similar construction specs across the strength industry, then you’ll notice that this rack is slightly on the more cost efficient side. 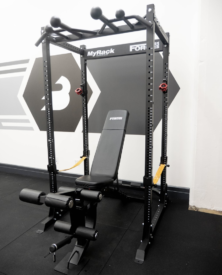 The add-on elements are decently prices and you could build a fully equipped power rack with a pull-up bar, j-hooks, and safeties for about $750.00. If we compared this power rack with other when it’s fully equipped, then you’ll notice that it’s one of the better priced racks. A lot of power racks don’t come with j-hooks, or safeties for that matter, some do, but not all of them. For this reason, we think this rack is one of the better options for price efficiency when fully equipping a power rack. A great warranty is a good piece of information for anyone worried about their investment lasting the test of time. Obviously, no one wants their power rack to break down fast, so a lifetime structural warranty is a good bid of confidence that Force USA has in their equipment. 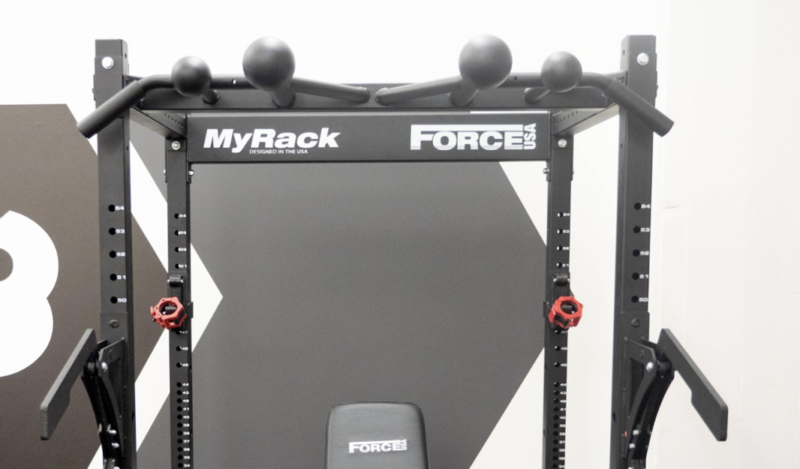 The Force USA MyRack Modular Power Rack is a good option for anyone looking to build out their garage or home gym. This piece of equipment comes with a ton of construction positives. In addition, this is a good option for anyone that needs a fully equipped power rack that has multiple add-ons like a pull-up bar or even a monolift.